After the events of Luigi and the Quest for Nothing, The Cheat steals the Nothing™ while Luigi wasn't looking! 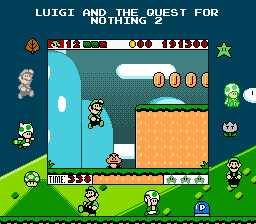 Now Luigi and his new partner, Green Toad, must go after The Cheat to recover his precious Nothing... This demo contains 10 main levels, 4 mini-games, and a LOT of secrets! so especially try to avoid these. These issues will be fixed in the next demo or sooner. How the do I clear all my data on this game!?!?!? I tried New Game and It didn't work, I tried re-downloading it and that didn't work! I tried deleting all the copies of it in temp file and sifted carefully through it and THAT DIDN'T WORK!!!!! But It looks wonderful and seem much better than the original so far except for the fact that the progress is literally impossible to get rid of. This is pretty good, and may even be better than the original when finished! No? But I'll look! Thanks for the info! Now I can play this!